Meet bGeigie #2209. We built her yesterday. Tod soldered 179 points. I did the non-soldering bits. The build took us most of the day, but it wasn't too hard. I think some of the time was taken up awe, making comments like "Wow, we're adding the smallest disk drive ever" and "This tiny thing is a GPS unit?" and "Gosh, they did a great job making this kit easy to put together." 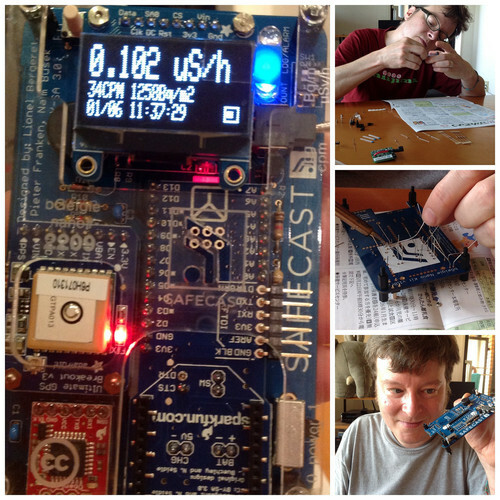 2209 is part of the Safecast project. Now we can roam around Japan to log radioactivity and report back to the international mapping project. Or we can point her at things and see the lights blink.